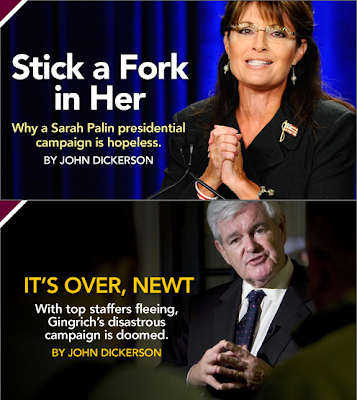 My favorite part is how Slate made sure to use pictures with them both in identical begging poses -- by all appearances capturing Sarah and Newt at the very moment that hordes of dissatisfied Republican voters burst in the door to carry them away and cast them down the Chasm of Electoral Irrelevance. You can almost hear the pair of them pleading: "No, I just need a little more time! I have this independent voter! I've got some leads out and I can get you two more by the end of next week!"